Often times, more money goes into finishing bathrooms and kitchens than any other room in a home, and California based Heath Ceramics is a top choice for tile when architects start selecting these finishes. Unfortunately though, the price of the gorgeous, holistically produced tiles can sometimes keep them from making it through to the final design. 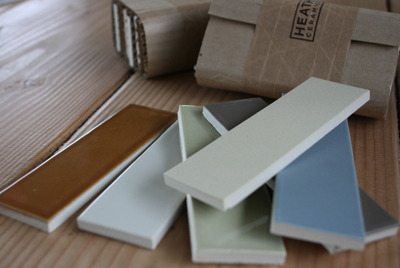 Well now, Heath is making it a little easier for builders and remodelers to save some money while still getting that clean-lined yet handcrafted look of their timeless tiles with their new Heath Ceramics Modern Basics line. To borrow language from the fashion world, think of the Modern Basics as the pret-a-porter of the typically haute couture Heath Ceramics. That's just to say that this new line is immediately available off the shelf for just $16.50 per square foot—40% less than the typically small batch, custom made Heath tiles. Worried about a decline in quality with the reduction in price? Well don't. Like all Heath tiles, the Modern Basics are only available directly through the historic Sausalito facility where all facets of production still occur. The savings are the result of a limited contemporary palette and an increase in production quantity. The Modern Basics are available in 2"x6" or 3"x6" tiles (plus bullnose and edge pieces) and six stock glazes chosen for their versatility: Muslin, Blue Fog, and River Bed are available in a matte finish while Soft White, Fern, and Cedar, come in the glossy finish. And of course, all Modern Basic tiles feature the artful inconsistencies in color that result from the process of handcrafting each tile.